This week’s Friday Bride did not let the weather rain on her parade, or rather her fair. Susie and Wes got married in Canterbury at an adorable venue complete with its own vintage fairground and marquee. 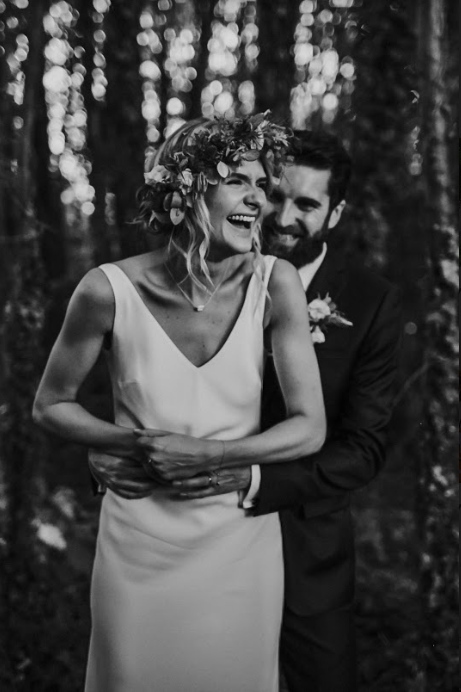 Despite the heavy rain during the ceremony, the bride looked flawless in the Payton dress with an Augustine jacket. Read on to find out about finding the perfect dress and how to plan a wedding to remember. 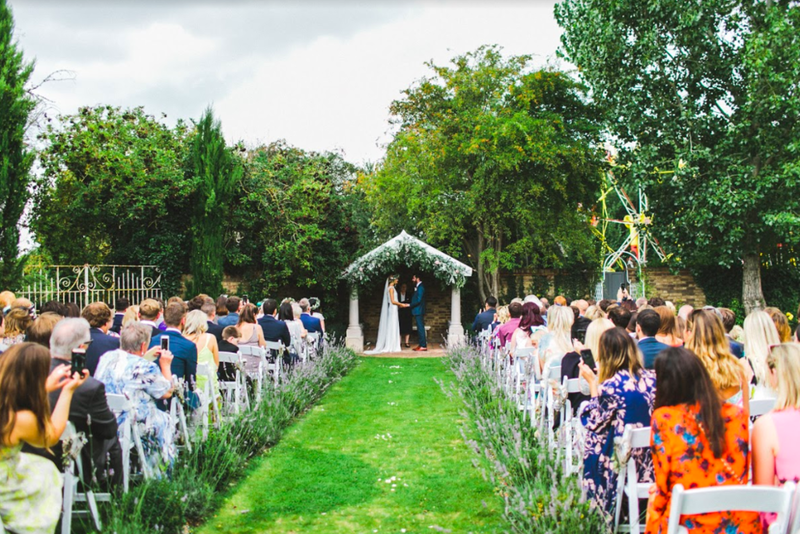 English country garden with a vintage fairground and a mid ceremony monsoon! It was a beautiful sunny day and we had been to Beachy Head for a walk. It was so hot we went down to the beach and had a swim in the sea and Wes asked if I would marry him. It was a lovely low key day and he had picked out a stunning vintage ring, knowing I had always wanted something vintage. I love it. The Payton dress with the Augustine top. I loved how simple the Payton was but wanted something to cover up a little for the ceremony so it was perfect. I actually thought I would take the top off as soon as the ceremony was over as i loved the look of the simple Payton but on the day I actually found that I loved wearing the top a lot more than I had thought, and kept it on right up until the dancing. It was so nice to have a change for the evening, although the whole train was soaking wet by that point anyway! I found this very hard as I am incredibly indecisive! I had seen a sample sale at a wedding dress shop very quickly after getting engaged so I thought "whats the harm" and booked an appointment. I panic bought a dress as I thought it was a bargain, but after a few weeks of deliberation knew it wasn't the one. I continued looking, went to SO many shops and was just a bit underwhelmed. I live locally to the Charlie Brear showroom in Queens Park so I just walked past and spotted it and made an appointment. As soon as I put the Payton dress on I knew it was the one. I LOVED it. I went home bouncing off the walls in excitement and I thought "that's how you are supposed to feel". Do not panic buy a dress in a sample sale! If you see a dress you love and you can get it in a sale then great, but make sure you have tried on a few dresses before and know what you want. A bargain is only a bargain if you would have bought it anyway! I loved the shoes they have in the Charlie Brear showroom that I had tried with my dress so I asked them where they were from and bought them! They were not expensive at all but gold with a block heel and I loved them. Our wedding was outside so the block heel was great on the grass and I will definitely wear them again. Yes I really did. I am a total perfectionist and really didn't want to be able to see the underwear under the dress. I tried so many options but in the end I just didn't wear any. I struggled a bit with this! I had so many make up trials where I had asked for it to be natural but ended up with so much caked on and didn't feel like myself. In the end I went to MAC and had a lesson and did it myself on the day. I am so pleased I did this! I panicked when it came to the eyeliner as my hands were shaking but otherwise it was totally fine. My hair was done by an amazing local hairdresser at Doo Dahs in Canterbury and she was AMAZING, so nice and calm and they did a fab job. Marleybrook House in Canterbury. Its a beautiful thatched cottage with a vintage funfair in the garden and a marquee for the meal. Its a stunning venue and the team are fab. I was incredibly nervous, but so grateful to have my dad with me and as soon as I saw everybody's beaming faces and Wes at the end I felt much better. I was still shaking though throughout the whole ceremony! We followed quite a few I think. I had something old, new, borrowed and blue and my mother in law gave me a sixpence to put in my shoe. We didn't see each other the night before the wedding and my dad walked me down the aisle. Wes hadn't seen the dress until the day either. We had the fairground which was great, and our ceremony was outdoors. It had been a beautiful sunny morning without a cloud in the sky but as soon as I started walking down the aisle it started to spit a bit. It got a bit heavier throughout the ceremony but when the celebrant asked if we should go inside everyone shouted "noooo carry on!!" and the venue staff came out with umbrellas, the guys took off their jackets for the girls and everyone huddled together! Our guests had amazing spirit! In the end though it really started to come down so we had to abort and all run into the barn. Wes and I had been under a cover throughout the ceremony so it was only after we saw how wet the guys jackets were that we realised how much it had been raining - eeeeekk!! We were SO grateful all the guests were in such good spirits and nobody seemed to mind (i am sure a few were just being very polite!). By the time the guests were all in the barn the rain was honestly bouncing, and as soon as Wes and I walked in everybody cheered, threw confetti and it started to thunder! You couldn't have planned better timing it was amazing and not your average confetti moment! There were loads of funny moments but the one that stands out for me was during Wes's speech. He is a Maths teacher but loves writing and producing music and years ago he had recorded a version of Steve Wonder's Happy Birthday for me, complete with a music video and a rap that he had made up. Every birthday this hilarious video comes out and even the kids at the school where he teaches have discovered it so they sing it to him down the corridors! Wes referred to this briefly in his speech but had not planned to actually do the rap, but everyone was cheering at him shouting for him to do it so he broke out into an unplanned live rendition and it was hilarious! The LOVELY and incredibly talented Andy and Szerdi from Andy & Szerdi photography. We had been recommended to them and although they were based in South Africa, they were more than happy to travel to Europe and travel loads with their work. We had a brief Skype chat and they were so lovely and totally understood what we wanted. They have a creative style and we love the photos, and it was also a total pleasure to hang out with them on the day! Spend time with your new husband! Don't panic about the small things. As long as everyone is warm, well fed and have a drink in their hand they are happy. I think we stressed too much about the small details rather than the most important things! Start getting ready an hour before you think you need to. The time in the morning flies and you want to make sure you have time for a drink and a chill before it all commences. Don't worry about the weather! Because we had an outdoor ceremony planned and a funfair, it felt like it was really important that it was going to be sunny and dry. I spent the weeks leading up to the wedding checking the weather forecast a million times a day, every day but in the end it is the one thing you absolutely cannot control. We couldn't possibly have been more "unlucky" with the weather but in the end it was such a good laugh, resulted in brilliant comradery and although the day did not go to plan at all it was totally amazing! We got married very far away from where our friends and family live and as much as everyone said they were happy to travel, in hindsight i don't think it was necessary and there we some people who couldn't make it due to the distance. If I could go back I would have been more considerate of that. I didn't find it easy at all. I am indecisive and disorganised and being centre of attention scares me, so planning a wedding does not play to my strengths! Wes was great and very hands on though, so I was grateful for that. I am not 100% sure. I would love to celebrate our first anniversary by having a dinner in the house wearing our wedding outfits! Music was a big part of our day and we had two amazing bands play. One was my sister's friend's band and they are incredible - sort of New Orleans style with a double bass and a washboard and they played in the barn in the afternoon which felt like a bit of a hoe down. Wes had also written me a song and performed it in the afternoon and it was absolutely amazing, there was not a dry eye in the house and he performed it perfectly. That was without doubt my favourite moment. Wes's favourite moment was seeing me walking down the aisle. Entertainment - Screamin' Miss Jackson and the Slap Ya Mama Big Band, Ariella Strings and Funky Nuts, our very own Wes Hughes! 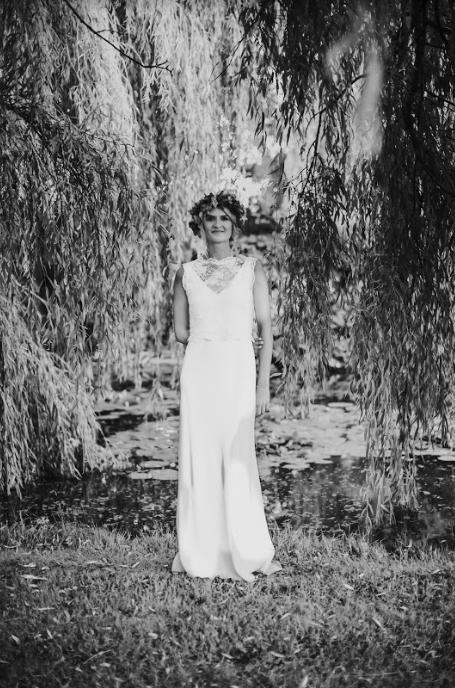 Did you catch last week's friday bride, Anais?